BigAnt for Mac is available now! 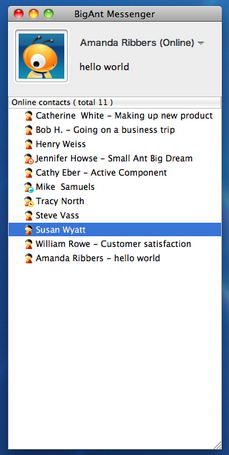 To extend our success of windows based messenger program, we develop and publish this Mac version BigAnt messenger program, it is still an easy of use office messenger, and keep all users in your company connected, no matter they are running Windows or Mac. This program requests your IT people install and setup of BigAnt server program on a windows based computer, and you can log-in your BigAnt account from either Mac or Windows computers. You own your LAN network, your own server, and you will have secure communicate using this encrypted BigAnt messenger. Vanishing Message is a file message that can be sent by email attachment or file transfer. The message can be read by the recipient then vanishes without a trace. So prove it!!! Did it ever exist?